Beer Pong is probably the most common drinking game in the U.S. Short overview of the game: Beer pong is played by two people or two teams of two. Each team has to get a ping pong ball inside a cup on the other end of the table. The other side of the table usually has 6-10 cups filled with a few ounces of beer (or water with beer on the side). If a ball makes it into a cup on your side of the table you have to drink the beer (or water then take a few drinks from your beer). The first team to successfully get rid of all the cups win! 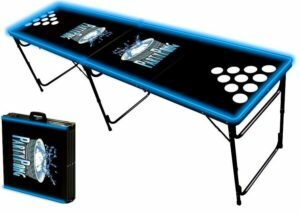 Having a beer pong table with cup holders helps keep the cups in order and from losing your beer. This is definitely a must have if you play with beer in your cups! First, let’s go over the rules and how the game works. Of course, what rules you play by is up to who is playing, it is always best to establish the rules before you start. 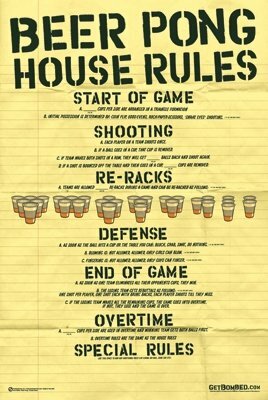 A lot of the discrepancies come from these rules: allowing the elbow to not cross over the table or the hand, swatting after a bounce, if you play the rule “Girls Blow, Guys Finger”, and how many times you can re-rack your cups and when. I suggest you make sure both teams are on the same page with these rules before starting. The World Series of Beer Pong has a really good, lengthy set of rules and how to play. This is great to read through, but don’t get overwhelmed! It is best just to have fun, in my opinion! If you really want to get serious, printing out a list of house rules is always a great way to go! CupsCo has a great short description of how to play beer pong. Other house rules I have seen are where girls can blow the ball while it is spinning around in a cup top and cause the ball to exit the cup. Guys can do the same but use their finger to get the ball out. This version of beer pong is starting to get popular where the space allows for it in events, beaches, and larger backyards. 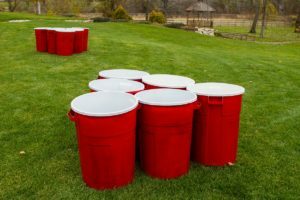 Giant Beer Pong can be played with buckets and tennis balls and set up just like regular beer pong. You can also just buy a kit that is actually really reasonable in price that comes with 12 buckets, red and blue, carrying case and game balls. If you want to really make it GIANT, playing beer pong on steroids is a blast! I would recommend using red trash cans to represent red solo cups and volleyballs, or inflatable beach balls, for the ping pong balls. 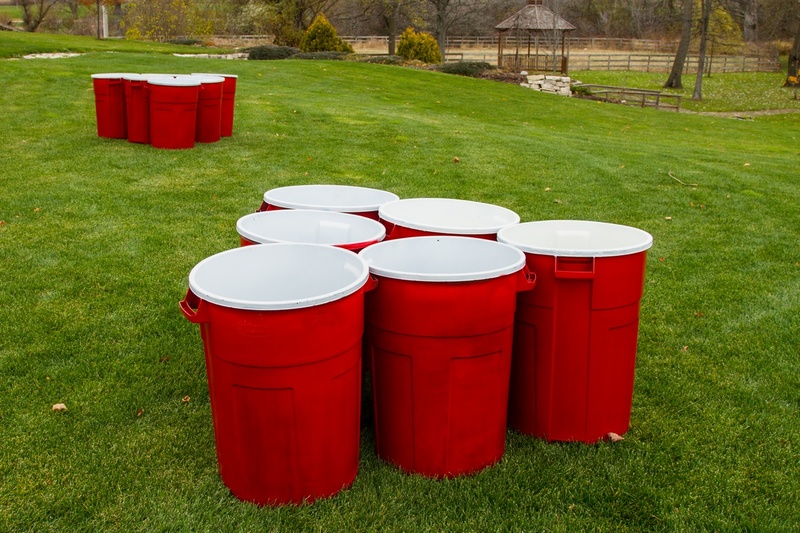 These red trash cans are perfect for the game! Watch Jimmy Fallon and The Vampire Diaries star Nina Dobrev play a round of giant beer pong on The Tonight Show. Granted they don’t have two sets, but it is still amusing to watch! This is a drinking take on the old board game, battleship. Beer battleship, or battleshots, or beer battlehops is using the pegs in the ships as drinks, so you have to drink every time someone hits one of your ship! This game is great with shots, beer, wine or whatever is your drink of choice! With liquor shots – I would recommend smaller shots and definitely, play with a partner! If you are playing with beer, pour an ounce or so into each cup. The goal of the game is to sink all of your opponents ships by targeting them! 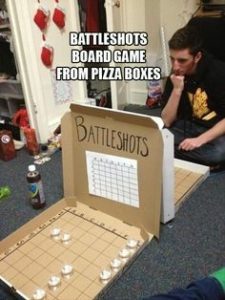 2 Large Pizza boxes (or larger) – If you want to make something last minute, find some cardboard the size of pizza boxes and tape them together to make a ‘bend’ so you have a flat piece on the table and a vertical piece for the backspace game board. 2 different colored push pins (we are going to use green and red for description purposes, but you can use any colors you want or sticky notes). Open the pizza box, for the flat side towards you write “A-J” down the left side and “1-10” across the top, leaving a space in the corner so the A and 1 do not overlap for a grid. Create the same grid for the inside top part of the pizza box so you now have two identical boards on both inside pieces of the box. Do the same for the second pizza box and you are ready to go!! Set up the Pizza boxes so the top part of the boxes are back to back so each team cannot see the other teams game board. The first team calls a spot like “D4”. If the other team has a shot from a ship on that spot they call “Hit”. Place a Green thumb tack on the vertical board on D4 so you know you hit their ship. The team who got hit needs to take their shot and place the cup upside down where it got hit. If the other team does not have a shot from a ship on that spot they call “Miss”. Place a Red thumb tack on the vertical board for D4 so you know you missed their ships. The other team can now take their turn where they get to call a spot and see if it is a hit or a miss and follow the rules for step 5. Fun optional end game: The loser of the game has to take the shots left on the winners board! When you are done – remove the pins and fold up your game to save for later to play again! This one is really simple to learn and great for a group and usually a shorter game (to shorten the game add rules like – ‘one hand only’ or ‘you touch it you take it’). Set up Giant Jenga outside. 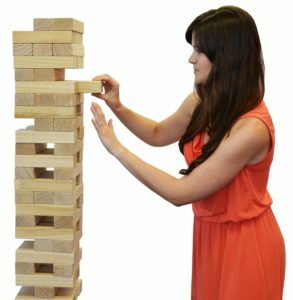 Here is our Outdoor Yard game post that is great to learn how to play Giant Jenga, where to buy or how to create your own DIY Giant Jenga. Play the game! If you do not follow a rule you have to drink! If you knock down the Jenga you can go chug a beer or take a shot! A great take on speed quarters is Giant Speed Quarters. To play this grab 2 garbage cans and 2 volleyballs. Substitute the garbage cans as the glasses and the ball as the quarters. Place a table in the center of the circle and with a cup and quarter for when someone has to chug their beer while a quarter is being spun if they get stacked and don’t make the ball in the top garbage can. Speed quarters, involves six or more people around a small table, several quarters, beer for each player, and two empty shot glasses placed in front of opposite players. When the game begins, the two players with glasses pick up a quarter and try to bounce it off of the table into the shot glass in front of them as quickly as possible. If the shot is not made they keep shooting until one makes the shot. This player dumps the quarter out and passes the glass to the player to his left while the other shooter continues to shoot until he makes a quarter into his shot glass. Eventually, when repeated enough, one glass will catch up to the other in rotation. When this happens, the player still shooting must overturn a glass and stack the other on top. He gets two chances to bounce a quarter off of the table and into the top glass. If he makes it on the first, he can pass the stacked glasses to any player, where that player get two chances, and so on. If the player makes it on the second shot, the glasses are unstacked, one passes to the player on the left, and one to the player opposite him. Gameplay resumes from the beginning. If the player does not get a quarter into the stacked glasses in two shots, the player on his right will spin a quarter while the “loser” chugs his beer until the quarter ceases to spin. Any player can blow on the quarter or spin it with their finger to keep it spinning. After this, the glasses are split like when the game started and it begins again. Game play ends when the players feel they are sufficiently inebriated. – Taken from Wikipedia, which also has other variations. Here is a great short video on how to play speed quarters without the stacking, which would be a great way to play if you switch to Giant Speed Quarters. 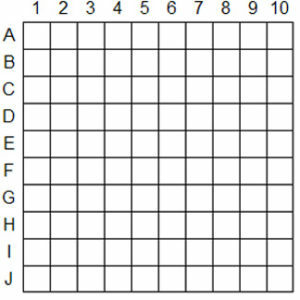 This is a pretty popular game at bars and house parties. The nice thing about this game is you can play with a lot of people! As long as you have an even number of people you can play with as many as you want! drink their beer and flip. This continues until all players go. First team to finish wins. 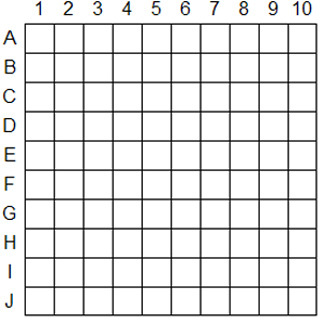 For the second round, the second person will start the game and then when it gets to the end of the table, the person on the other end who has not gone yet has to go after. This ensures that everyone can drink for those teams that don’t always get through their beer. Play Survivor Flip Cup. This is “every man for themselves” style. All cups get filled with beer to the first line. Everyone raises their glass, one designated person calls go and every must touch the table with their cup, chug and flip. Once your cup is flipped raise your hands. The last person to flip is out. Then the game continues until only one person is left. Setup of the Stump Game – but remember you should only be using ONE hammer for everyone that is shared. Mark each nail with a sharpie 1″ from the point. Hammer in the nails to the top of the sharpie line around the outside top rim of the stump – 1 nail per player. Pick a player to go first – they get ONE hit at their nail to try to drive it in. After the one hit the SAME hammer has to get passed to the person on their left who then also gets one hit at the nail in front of them. 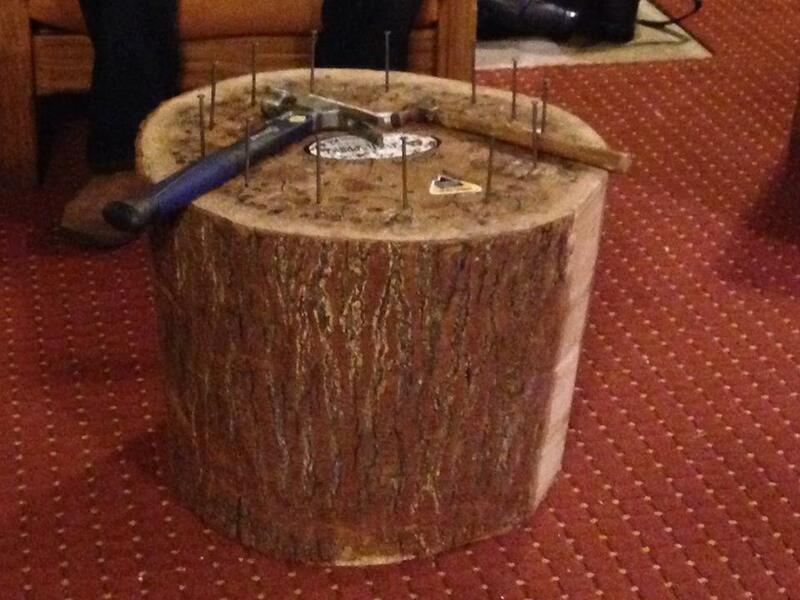 Step 5 continues until all nails are completely in the stump. If the person misses their nail that have to take a drink. If a nail is bent they have to leave it for their next turn, on their next turn they can choose to straighten out their nail with the hammer but have to take a drink and they are not allowed to hit the nail also. One a nail is flush with the stump (completely flush), they choose someone to drink. The last person has to take a shot! Make it fun – if a beer is not in your hand when you hit the nail, then you have to drink if someone calls you out. Add a twist – before the game have everyone create 2-3 challenges or dares and put them in a bag. The loser has to also draw out of the bag and complete the dare. Coaster flip originates in Ireland and is great for 2 to how many ever players you have! This also could be played in teams just like flip cup where you have to flip a coaster vs. the cup and take a drink before you flip the coaster. Lots of coasters! See if your local bar or brewery has a stack you can have so you don’t have to pay! Otherwise, you can order some from Amazon pretty easily! Here are some plain coasters on Amazon. Searching for Cardboard Coasters can also give you variations. Place a large stack of coasters in the center of the table. Place the coaster on the edge of the table, use the back of your hand to flip up and over (has to flip). Catch after an 180 degree flip. (Must use only one hand). Start with one coaster, all players flip at once. When you catch it, hold it in the air. If you do not you get one chance to redeem yourself (wait ‘til everyone does their first flip before trying again). If you don’t catch it again you are out. Continue with the following number of coasters: 1, 3, 5, 7, 10, 12, 14, 16…continue by 2’s. Whoever is left at the end wins! Go in a circle catching the pile one at a time. Check out this web-site for more great information and a video! This is an unexpected game for most as it isn’t that common, and the materials are super easy to buy, or you may have some laying around the house already! This game is good for 4 to how many ever people/trays you have! 1 Ice Cub Tray per person – use differently designed ice cube trays for the event/season! Create two even teams. Each team stands on the opposite side of the table with an ice cube tray and straw in front of each person. Fill each cube spot up with beer to the top. 1 player from each team on the same end of the table start at the same time. They must drink all of the beer out of their tray (usually, you have to go back through your tray 1-2 times to get all the beer that falls back out of the straw the first time, make sure it is cleared out or you’re disqualified). When a player finishes the beer then the next teammate starts. This continues ’til the first team has all of their players finished. Tie? Have a cup at the end and see you can flip it first! For a video and pictures visit this website! This is pretty awesome as I have just recently started seeing this game! It is extremely popular in Germany and Europe. Headis is a fast past, no hands heads only game of mixing soccer and table tennis. Headis is a hybrid of table tennis and Soccer. Headis was invented in 2006 by Rene Wegner in Germany and became a German wide tournament in 2008. Headis has grown immensely over the last few years and in 2010 it got awarded as one of the finalists of the world’s largest start-up competition in the sporting goods industry! Check out more information here. Headis is being played with a special rubber ball that weighs 100 grams and has a circumference of 50 cm. The Headis Match Ball. A player has to win two sets to win the game. A set is won when a player reaches 11 points first. If both players have 10 points you have to get two points ahead to win a set. The service has to bounce on the own side first and then on the opponents side. If the ball touches the net or the opponents edge the service will be repeated. A mistake at the service leads to a direct point for the opponent. Die direct header without touching the table is allowed (Volleyheader). After each Volleyheader you have to touch the ground with any part of the body. The right to serve is played off before the game and changes after three played points. If the score is 11:10 the right to serve changes after two played points each. After each set he right to serve changes as well. The players are allowed to touch the table with any part of their bodies permanently. The point is lost if you touch the ball with any other part than your head. Tips: Put your hands on the table and bend your knees. Always watch the ball and smash it with your forehead.